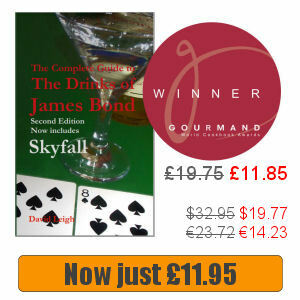 A look at the meals and drinks consumed by 007 in the third James Bond novel. Prior to being briefed by M, James Bond arranges to go to lunch with Bill Tanner. But when he exits M’s office he finds the Chief of Staff long gone and so he eats alone in the canteen instead. There he orders grilled sole and a large mixed salad with his own dressing laced with mustard. Surprisingly James Bond seems to be handy in the kitchen. He also eats Brie and toast,all washed down with half a carafe of white Bordeaux and two cups of black coffee. This time M’s briefing wasn’t about official business but something personal instead. Sir Hugo Drax was a member of Blades, M’s private club, and he was strongly suspected of cheating. He was also a national hero so needed to be warned off without creating a scandal for him or the club. M therefore invited Bond, the best card player in the Secret Service to join him at Blades. His mission was to establish how he was cheating – and let him know. So that meant dinner that night at Blades. When Bond arrives M is already there. Initially Bond refuses a drink but soon after orders a vodka martini with a large slice of lemon peel while M enjoys his whisky and soda. After they play piquet for half an hour Bond counts out three pound notes and tells M he needs to learn properly how to play. He has never beaten his boss. Afterwards they watch Drax play Bridge. Soon Bond spots how he is cheating. Drax’s polished cigarette case allows him to see the card faces every time he deals. Before playing against Drax and his partner M and Bond make their way into the dining room. M chooses Beluga caviar, devilled kidney, a slice of bacon and peas and new potatoes, followed by strawberries in kirsch for dessert. The waiter also offers him a marrow bone to follow dessert. Bond orders smoked salmon as a starter followed by lamb cutlets. As well as peas and new potatoes Bond also asks for asparagus with Béarnaise sauce. He finishes off with a slice of pineapple. M also orders a half bottle of Mouton Rothschild ’34 to go with his meal. When Bond asks the wine-waiter for a recommendation he suggests the Dom Perignon ’46. After it is brought the the table Bond stirs Benzedrine, an amphetamine, into his glass. “It’s what I shall need if I’m going to keep my wits about me tonight,” he tells his boss. By the end of the meal Bond had finished the bottle. Afterwards Bond partners M against Drax and his partner, Meyer, at Bridge. The four men have coffee, cigars and the club brandy, a Cognac from the Rothschild estates. M then offers Bond another bottle of Champagne. “The second bottle always tastes better”, M says before Bond gives Drax a taste of his own medicine. 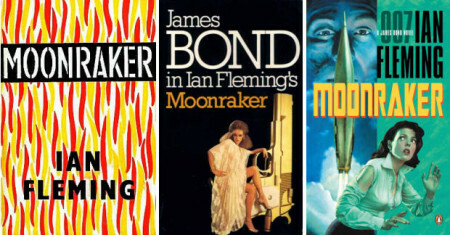 The next day Bond is assigned the Moonraker case. Major Tallon, the security officer on the project, was shot dead in a pub near Dover while Bond and M played Drax at Bridge. 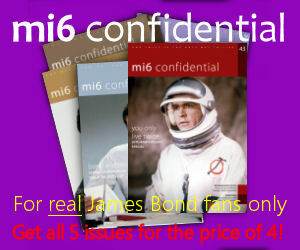 Bond is sent to Kent to investigate and stops at the pub, the World Without Want. There he orders a large whisky and soda made with Black & White. The first time Bond meets Drax at the Moonraker complex he arrives just as drinks are about to be served. Drax asks his right-hand man, Willy Krebs, to mix his “excellent dry martinis”. Krebs brings four full glasses – and a frosted cocktail shaker – on a silver tray. 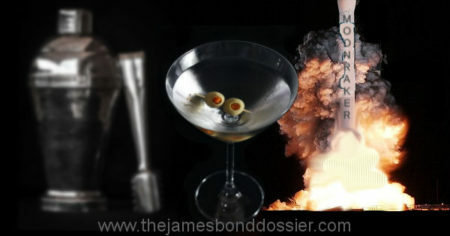 Bond finds the martini excellent. Drax tells Krebs to pour him another before dinner, which is served promptly at eight. After an attempt is made on his life while with undercover policewoman Gala Brand, the pair go to St Margaret’s to clean up and get something to eat. At the now demolished Granville hotel they are fortified with stiff brandy-and-sodas (two for Gala, three for Bond) followed by fried soles, Welsh rarebits and coffee. Who would have thought Bond would be happy with the simple pleasures offered by cheese on toast? Later Bond is captured by Drax and his men, who tie Bond and Gala to their chairs. and he and tied to After using a blowtorch to free themselves but with the near certainty of being incinerated during the Moonraker’s launch, Bond searches Drax’s desk. It yielded a half full bottle of Haig and Haig, from which he fills three-quarters of a tooth glass. He knocks it back in two gulps. He pours Gala a drink and refills his own glass before telling her his plan to stand under the Moonraker and blow it up by igniting the fuel vapour with his cigarette. Luckily she has a better plan.